​Our newsletter is published at the beginning of the month. Here are your headlines from the month of September. 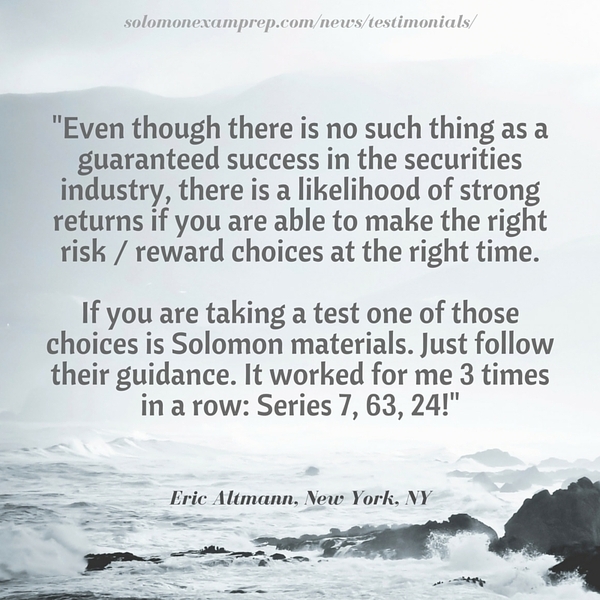 "Even though there is no such thing as a guaranteed success in the securities industry, there is a likelihood of strong returns if you are able to make the rights risk/ reward choices at the right time. If you are taking a test one of those choices is Solomon materials. Just follow their guidance. It worked for me 3 times in a row: Series 7, 63, 24!" Rationale: A perpetuity is an annuity or stream of payments without end. To calculate the present value of a perpetuity, you divide the periodic payment by the rate of return (also known as interest rate or yield). In this case there are two ways to reach the answer: (1) Divide the 2% rate of return by 12 to get the monthly rate of return: 0.001667, then divide the monthly payment by the monthly rate of return: $5,000/0.001667 = $2,999,400 or (2) Multiply $5,000 times 12 months to get a $60,000 annualized payment to the family and then divide that by the 2% yield or $60,000/.02 = $3 million. Congratulations Kate F., this month's Study Question of the Month winner! *October's Study Question has been posted! 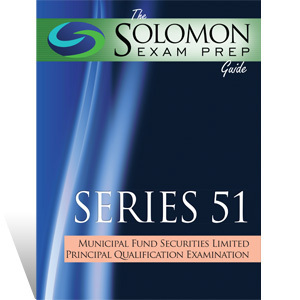 Solomon Exam Prep announces publication of the 2nd edition of The Solomon Exam Prep Guide to the Series 51 Municipal Fund Securities Exam. Written in clear English with practice questions, exercises and visual aids sprinkled throughout, the comprehensive Solomon Exam Prep Guide will get you on track to passing the Series 51 Municipal Fund Securities Limited Principal exam. On September 30, 2015, FINRA announced that 208 Series 24 test takers were incorrectly assigned failing grades for that exam. The individuals affected by this issue all took the test between July 13 and September 24, 2015. A FINRA representative reports that this incident affected test takers who were close to the passing score of 70%. On September 25, 2015, FINRA implemented a new rule regarding the relationship between investment banking personnel and research analysts. FINRA rule 2241 replaces NASD Rule 2711 and NYSE Rule 472. NASD Rule 2711 was created to prevent investment bankers from pressuring research analysts at the investment bank to write favorable research reports about securities that the investment bank was distributing or planning to distribute. The MSRB has announced that the Series 50 pilot exam will be available to test-takers from January 15, 2016, to February 15, 2016. Registration for the exam begins on September 21, 2015, and closes January 14, 2016. The pilot exam is a precursor to the Series 50 permanent exam, which will be the qualifying exam for municipal advisors. Those who pass the Series 50 pilot exam will not be required to take the permanent exam.